Although a third round pick would not generally qualify as a steal, Keenan Allen has emerged as an elite wide receiver and one of the best offensive values from the 2013 NFL Draft. A slow start kept him under-the-radar, but Keenan Allen put forth an impressive rookie season and collectors have taken notice of this explosive receiver. 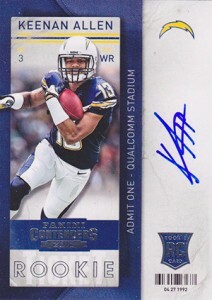 As a five-star recruit, Keenan Allen was regarded as one of the best high school wide receivers in the country. After high school, Allen decided to attend the University of California and was a starter for the last two of his three seasons. Widely considered to be one of the top wide receivers in college football, Allen chose to skip his final season and declared for the draft. He was pegged as a likely first round pick, but a late injury resulted in a disappointing performance on his pro day. The San Diego Chargers made Keenan Allen the 76th overall pick in the 3rd round, and the eighth wide receiver taken. Keenan Allen entered his rookie season with the Chargers on the bench, but injuries and his talent quickly pushed him into a starting role. Even though the Chargers had an inconsistent season, Allen gave the team a legitimate deep option for Philip Rivers and the team made the playoffs. Now with more playing time under his belt and increased rapport with Rivers, many expect Keenan Allen to produce at a high level for the foreseeable future. 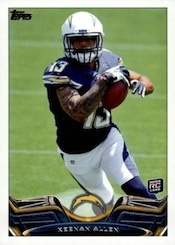 Collectors have plenty of 2013 rookie card options for Keenan Allen, including many premium releases. Also, as a top high school player, Allen participated in the 2010 U.S. Army All-American Bowl and his first cards were featured in the 2010 football product from Razor that covered the event. This product includes multiple autograph parallels. Click the listings to shop for singles on eBay. Normally one of the most popular high-end products of the year, 2013 National Treasures continues that tradition. 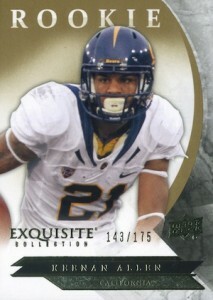 Rarity, brand awareness and a quality design makes this the top Keenan Allen rookie card available to collectors. 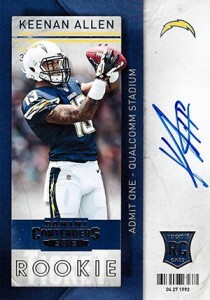 Arguably one of the most popular mid-level releases each year, 2013 Contenders is a great place to find Keenan Allen cards. 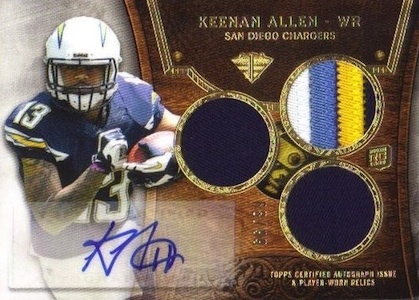 Although they are not numbered, possible short prints and variations make this one of the top Keenan Allen cards. The base version is shown on the left and the variation is on the right. 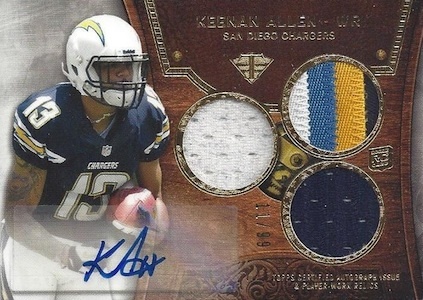 2013 Topps Triple Threads actually toned down the rookie design this year, and this autographed jersey card checks in as one of the best Keenan Allen cards. 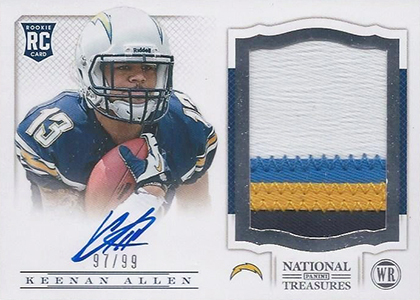 They are technically two Keenan Allen cards included in the base rookie set, but the difference is subtle. The print run seems limited with only 99 of each card, but once you add in all the parallels, there are actually over 280 of each version and 564 total cards. 2015 Philip Rivers Melvin Gordon RC Antonio Gates Keenan Allen 4 Patch PRZM 25!